В нашем третьем выпуске мастер-классов Марина Петрова расскажет о \"семи нотах флористики\", о том как благодаря базовой технике сборки цветов можно создавать самые разнообразные букеты в любой ценовой категории. Hello everyone! My name is Marina Petrova and today I will tell you. How I work at my exhibition-sale and specifically in a white theme. What kinds of bouquets I do. How i put stuff inside how i put greens and how to make these bouquets. The easiest way to learn from the classic example collected in the technique of a spiral..
What is spiral technique? 90 percent of all bouquets are made in this technique. This is the key to your success..
As music, which consists of seemingly only seven notes, knowing how to make this simple and light bouquet, you will make great floristic music..
For our classical wonderful bouquet we need flowers such as:. No more than 3 kinds of flowers, maybe 4. Among the greenery it is: fern, burngrass, panic grass, alchemilla.. This is a classic bouquet, so I have it on sale in the package..
Only 2 bouquets are allowed to stand at my exhibition in the package. How we do it ... We take felt with a membrane so it does not get wet..
Folding. This is how we we fold it. We fasten with the stapler: once or twice. We will require 4 pieces of such packages for this bouquet. Take the main flower. In this bouquet I will have gerbera as the main flower.. Determine the assembly point. We know that if we need to make a small bouquet -. We have a high assembly point. hope you will remember this it woks for small or bridal bouquet. Mid-point assembly - this is our bouquet and a low assembly point, if you need to make a large and voluminous bouquet.. Define the assemblage point, take the fern and start making our spiral.. The first flower, the second - you see I'm making a bouquet practically when it is lying down.. The third flower - here is our foundation, our spiral..
Further take a little bit of bergrass. Take small fragments..
Small fragments like this. Now put the fern under this flower, the fern we have here is under this flower. That's all!. This is the basis of the bouquet. Further add to the right and left, right and left, let's do it..
You see my arm is resting, my hand is resting.. In the middle, we add a little fern: two or three, so that our bouquet was not filled only by the fern,. So that it was as a whole.. The atmosphere of this bouquet is like if you were in the field and collected such a light-easy field bouquet.. I reach the middle of the bouquet, I made half a bouquet. And as I finish this bouquet I'm getting it closer and closer and raise, but now I I'm still doing it lying..
Now i am doing this bouquet slowly, but generally it takes 7 minutes. Here I am already finishing this bouquet. This is a classic bouquet, so I show it to you in package..
Another bergrass on the back and the last lisianthus. Now you can lift it.. Here is your bouquet is ready. We make a bouquet on one bunch, so. Before tie this bouquet, please fix all the flowers and after you will dress it with the package it will be a little more puckered up. That's all. Look: symmetrical spreading; field, light bouquet. And only here my hand begins to strain. Here is our spiral, Here is our point of assembly, where we have determined it.. Here we fix bouquet. The bouquet is fixed on one bunch. The second bunch we will have when we put on packing.. I'll ask the assistant to help me put the packaging on, because if I put it on myself,. I worry that it will move away from the bouquet.. So it can not be that the flowers live separately,and the packaging lives separately,. And greens, which we fill the bouquet lives separately. No! it is a single whole!. The first packing, the second, the third. And here. Packaging can pinch a bouquet, so when you are collecting it, do it more air realizing that around 15-20 percent of it will be clamped when you put on the packaging.. Fixed the green: smooth, symmetrical spreading..
That's all! And the last fixation!. Here! My bouquet is ready! So: symmetrical spreading of the material;. Spiral technique; atmosphere of bouquet is light and wild field..
Our fern does not live separately - it is in a single concept with this a bouquet; and our packaging - it complements the bouquet. It looks very good. Classical bouquet collected symmetrically in spiral technique..
On the example of this bouquet we learned the spiral technique. How does it help us? Suppose the client comes and says: "hello, I want to have the same bouquet, pick me up such with the rose, lisianthus, iris, astilba or something else.". This bouquet, which we made with you, takes about 7 minutes..
At retail, you need to collect flowers very quickly - you collect them just same way, as I was making now my bouquet. When we prepared retail flowers we immediately collect the bouquet for the client..
Also, without straining the hand I I show ... Also when it is lying on the table we do our bouquet..
That's it! It is the same spiral technique! If you want to make a bouquet more volume, then you can relax the bunch. If you need to collect it more you can slightly tighten and fix. So you quickly collect a bouquet for client..
That is all! The bouquet is ready!. I will show you how in the technique of a spiral we can easily and quickly collect large enough number of roses. Also: the first rose, the second, the third ... Here is our the basis, here is our spiral..
Then the roses lie in a spiral. you see, they lie in a spiral. If your hand is tired and you have more roses, you can put these roses.. Put it so, do technical bundle preserving the spiral.. So, you add and scroll, add and scroll and fix. And your spiral will not go away. That's it! Our spiral bouquet is ready..
We learned with you how to do a classic, symmetrical bouquet collected in a spiral. In this classic bouquet is best to use such flowers as: mini gerberas, gillyflowers, lisianthus, freesia, tulips..
From green you can use: deadwood, bergrass, panic grass, alchemilla or boplerum,. And eucalyptus, if you make a pink or blue bouquet. Please do not put a bouquet in the package such flowers as:. An exception can be only the desire of the client or if you have absolutely no flowers at the exhibition, and the bouquet must be done From greens please don't use:. Aspidistra, monster asparagus plumosus ... This is a light, field bouquet - no more than three or four kinds of flowers and no more than three or four kinds of greenery and you will succeed! So, this bouquet is ours a classical bouquet.. Suppose we put on high heels or necklace and here you are - you already have a bouquet for the theater. We put on a sports jacket or sneakers and we can go for a walk in the park .. That means, this bouquet is the basis, it will allow you to do more complex,. With a different character bouquets with the correct setting of material and greens..
On the example of this bouquet you will learn how to work correctly..
Today we are going through a white theme, try to do every bouquet you make with different character.. The previous bouquet was light field character Why did I ask not to place an aspidist? Because if you put in a light, field bouquet aspidistra, then this will be the gap between symmetrical light bouquet and grouped bouquet..
And then it is unclear where we should move further, but we must show a variety of bouquets, a variety of characters. And a different putting of material and form. Look please - this is a grouped bouquet. Here I work with aspidistroy - it works great here: hydrangea, chrysanthemum - this is what we did not put in a field bouquet..
And the character of this bouquet is dense, powerful and serious.. Please look at the bouquet made on the frame of blueberry: same spreading of material in groups, but. Without aspidistra and fewer colors and therefore, of course, this a bouquet is much cheaper. It is very important that your bouquets were not only in different technique, but but also in different pricing category and the most important thing is that we show a variety of bouquets. In each bouquet, each material works in a special way. Please see one more bouquet: amaranth, I show now the type of bouquet look how good the amaranths work here, looks great and how fine asparagus works for us. 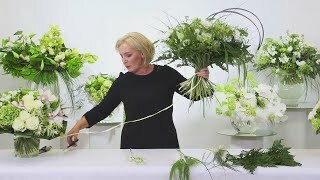 That means, in each bouquet, each material, each green is visible..
And tulips - work with tulips, twist them, show their beauty..
Green carnation, viburnum, but the main amaranth and plumosus..
A modern version of a classic bouquet collected in a spiral,. As I told you about the dress ... Now imagine that we are dressing a classy bouquet. With such beautiful mossy frame, like i said sports jacket. And here we have a version of our classic bouquet, but in a more modern presentation..
And there are options which you easily will be able to do..
Talking about monsters, anthuriums, in regard to orchids I suggest you such a bouquet form where the greenary is working beautifully running greens,. Also spiral technique as we see, is a magnificent frame of white feather, green natural, greens of an orchid is it's leaves, viburnum, And so I work with orchid phalaenopsis - putting it on gorgeous, soft frame - this is our dress, which we dressed with high heels and with beads..
See other master classes of the Flower Theater! Subscribe to the channel! Put likes, ask questions. See you!